MCS congratulated its graduates as they prepare for the next big phase of their education – junior high. During the ceremony, graduating sixth graders gave impressive and heartfelt speeches to a packed house highlighting their valued experiences at the school. 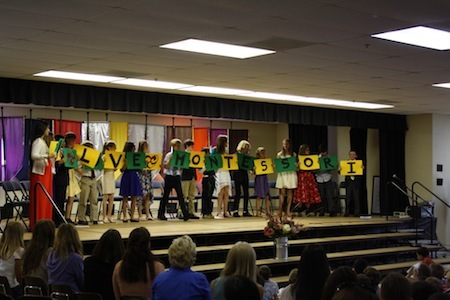 Nearly half of the students that stood on the stage had attended Montessori Center since they were toddlers, and fondly referred to the school as their second home and the teachers as members of their family. We at MCS wish these students all the best and are so very proud of them! Each of them represents what is best about an MCS education in their own unique way. May they always remember that learning is fun, that you learn from mistakes, that everybody has gifts and challenges, that we are more similar than we are different, and that we can solve big problems when we work together!